Today is the hour of destiny. Don’t you know that the heart can burn what the mind cannot break? So listen to them, heed them: Who never touch the earth, can never be in heaven. For God. He will remember and tell us all. Spirit, I put on wings! What I saw and heard wrote here for all you to read. My heart stopped, my breast frozen, my lips and eyes barred. Still in the world, but not of the world. Here, yet already departed. I am lonely and weary! As I sing for myself alone. As a star offers its rays. searching for his love's face. The worms of memories to work you woe. 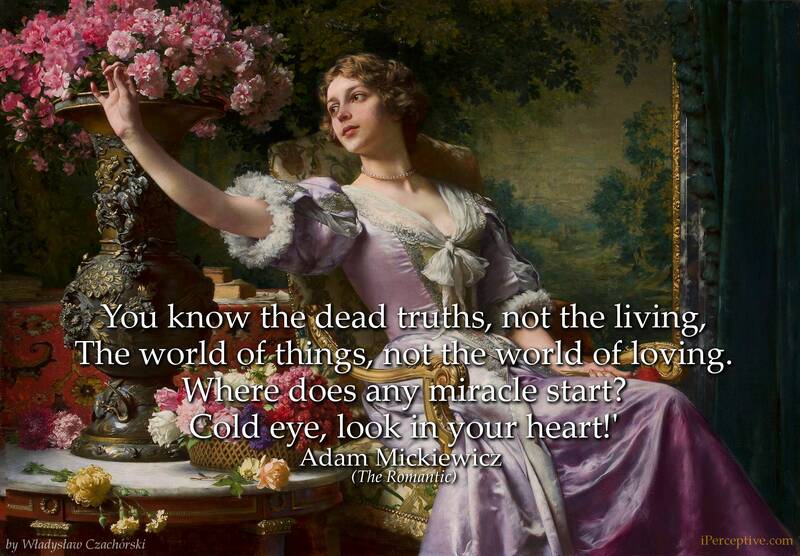 The world of things, not the world of loving. Where does any miracle start? My songs, ye do not need men's eyes, men's ears ! Flow in the deep places of my soul, shine on her heights, even as subterranean streams, as stars beyond the skies ! '"Oh, God, oh, Nature, hearken unto me ! My music and my song are worthy of you : I am the master ! I, the master, stretch forth my hands, I stretch them even to the skies, and I lay my hands upon the stars, as on the crystal wheels of an harmonica. Now fast, now slow, as my soul wills, I turn the stars. I weave them into rainbows, harmonies. I feel immortality! I create immortality! And guarded you, Crimea, thankless land! And shelter reptiles, or men more debased. The grapevine holds him, like a worm, embraced. Where mourning banners flutter to the plains. Look, the abyss, the downward sky, the sea! darkens a half-world with its own sad night. Look, on its forehead ribbon flames and hovers! ravines, thresholds we must at gallop span. if not, there is no path beyond for man. Dark faces brooding on the shore. And dim its surface as they die. Of thunder do not mar their calm. Still lie in silence, vast and clear. The images that gave them form. Onward and onward without end. Whom the world has idolized! Today I shall know if I am the highest of all, or only a presumptuous man. When, a prisoner and blind, he pondered at the foot of the pillar. Till I come to the borderline that separates Nature and God. 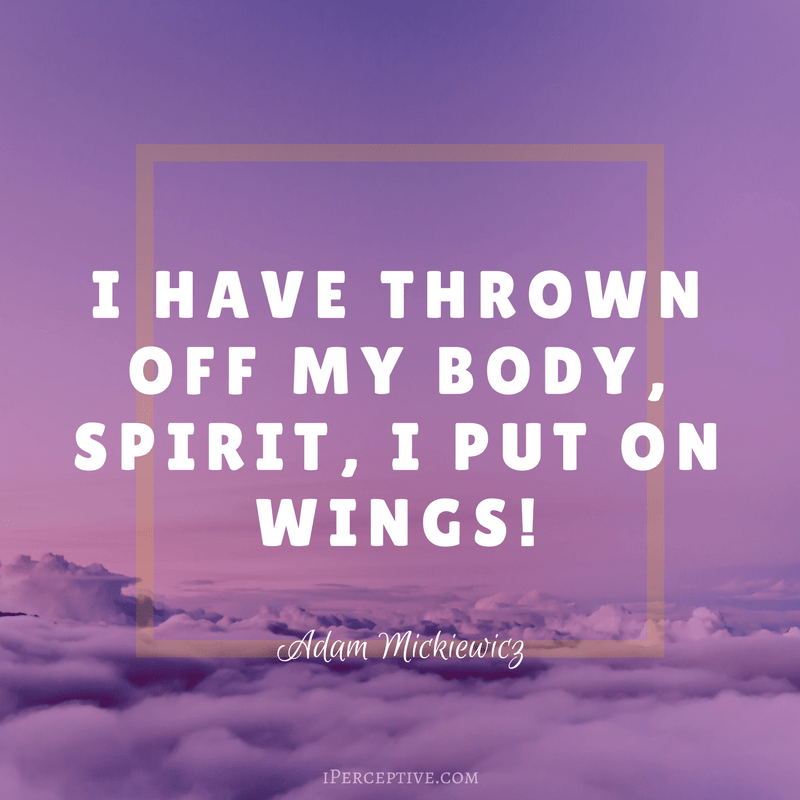 I have them, I have them – those two wings! I shall rise on the rays of my feelings – I shall reach you! I shall look into your innermost feelings. How high my wings rise! There I have loved, my heart has remained in my country. I would make it the wonder of the world! I lack the means and have come here to wrest them from you. The power of the feelings that seethe like a volcano within me. Only smoking in words now and then. I have yet to discover. There are other immortals – but none I have met are superior. Am supreme in the valley of earth among men of feeling. I believe it. What they have done I also can do. As you govern souls, so would I govern them. You are Wisdom, no more. In securing some part of your power. Against the wise and the ignorant. And I suffer for millions. Like a mother the child in her womb. And never are wrong, so they say! I’ll tear out its eyes. Where will your flight end? A part of that power that pride has won on the earth. With that particle only, what happiness I could create! You are silent! – You refuse it to the heart, then give it to the reason. Am I right... You are silent...But I do not lie. You are silent. You trust in the strength of your arm! Like a ball in the deadly cannon. Lord, what am I before thy countenance? I, dust, may yet hold converse with my Lord. Is all delivered into Herod’s hands. White roads that stretch through wastes too distant to descry! And this one finds its outlet in the sea. Like clouds driven onward by the winds. Dost thou destroy them all, so young, so young? And wilt thou wipe our race out utterly? The restorer of our land! Shall be forty and four. “To the judgment hall!” – The multitude leads in the guiltless man. And yet the kings shout, “judge him! Punish him! Crucify Mary’s son and lose Barabbas! Must he still bear it? Lord, be merciful! Strengthen thy servant lest he fall and die! Made of three withered peoples, like dead trees. 1 Austria (in Old-Polish Rakusy). Now is my nation on the martyr’s throne. While Mother Freedom stands below and weeps. And from my guiltless nation blood has gushed. And God will pardon him his sins at last. Yet is not vanished from our sight. And he displays his pierced hands to all. Who is this man? He is the viceroy upon earth. How have his soul and body blossomed forth! Veils him from nearer glance. He is exalted over men and kings. For ages unto ages, shall be forty-four! Is it you, my Johnny, my true love, my dear? Show you the way now! And tiptoe lest stepmother hear! Save me, Mother of God! I'm afraid. But why? Why should I flee you now? Not Johnny! My Johnny won't hurt me. Your eyes, your white shirt. Cold as winter you are! Kiss the chill o f the mould from you. Seeing nothing, the blind ones! Johnny! Where are you going? Don't leave me! I am forlorn! A pitying crowd to her. While he lived, he loved her entirely. 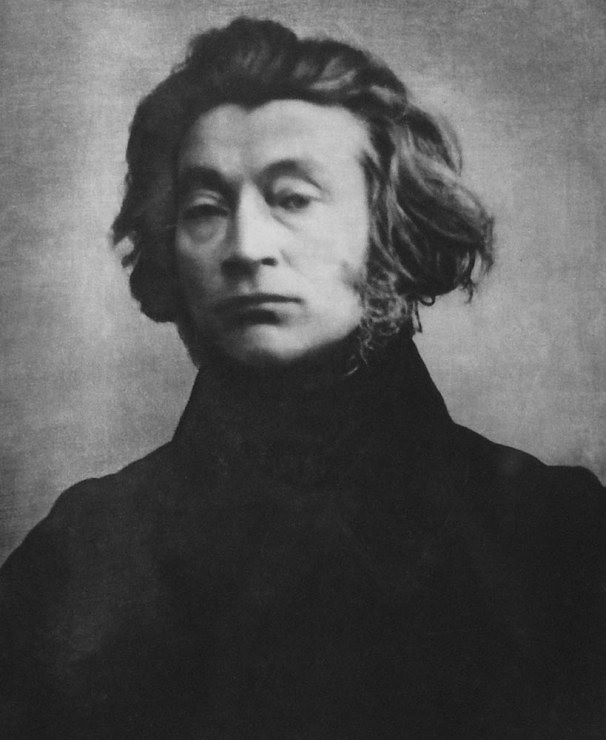 Adam Mickiewicz was a Belarusian-Polish poet and writer. 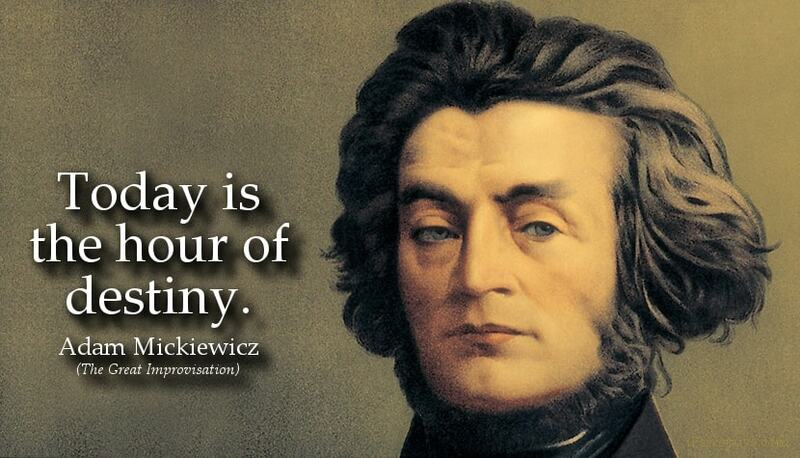 He is best known for being one of the foremost Slavic romantic poets of the 19th century. His most notable works are Dziady (Grandfathers) and Pan Tadeusz.